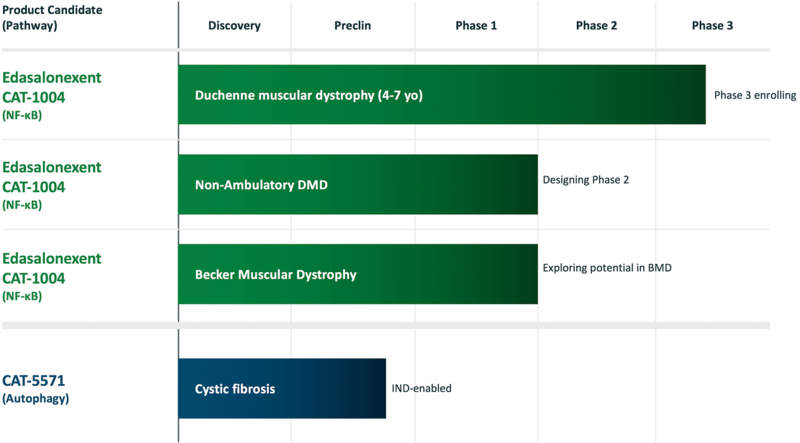 Edasalonexent is a novel investigational drug being evaluated as a potential treatment of Duchenne muscular dystrophy (DMD) that we designed to benefit all boys affected by DMD regardless of mutation type. Edasalonexent inhibits NF-κB, an important mechanism in DMD because NF-κB regulation plays a key role in skeletal muscle health and activated NF-κB is seen in boys affected with DMD prior to the clinical manifestations of their disease. In the placebo-controlled Phase 2 and open-label extension of the MoveDMD trial investigating the safety and efficacy of edasalonexent in boys enrolled at ages 4 to 7 affected with DMD (any confirmed mutation), edasalonexent preserved muscle function and substantially slowed DMD disease progression through 60 weeks of treatment compared to an off-treatment control. Consistent improvements in all assessments of muscle function were observed after more than a year of oral 100 mg/kg/day edasalonexent treatment compared to the rates of change in the pre-specified control period for boys prior to receiving edasalonexent treatment. Additionally, supportive changes in non-effort based measures of muscle health were seen, with significant longer-term reductions in muscle enzymes and C-reactive protein (CRP), supporting the durability of edasalonexent treatment effects. Edasalonexent has been well tolerated with no safety signals observed in the trial. A Phase 3 trial with edasalonexent in DMD is being planned. Favorable safety, tolerability, pharmacokinetics and positive biological marker results were observed in Phase 1 trials with healthy adults and boys affected by DMD who received edasalonexent. In animal models of DMD, edasalonexent inhibited NF-κB, reduced muscle degeneration and improved muscle regeneration and function, and beneficial effects were observed in skeletal muscle, diaphragm and heart. FDA has granted edasalonexent Orphan Drug, Fast Track and Rare Pediatric Disease designations for the treatment of DMD. The European Commission has granted Orphan Medicinal Product designation for edasalonexent for the treatment of DMD. CAT-5571 is an oral small molecule designed to restore host defense by activating autophagy being developed for the treatment of cystic fibrosis (CF). Autophagy is a mechanism for recycling cellular components and digesting pathogens, which is depressed in CF. People with CF suffer from persistent lung infections with opportunistic pathogens such as P. aeruginosa and B. cenocepacia, causing chronic infections that are difficult to eradicate and ultimately lead to respiratory failure. CAT-5571 has been shown to restore autophagy, reestablish host defense and enhance the clearance of pathogens, including P. aeruginosa and B. cenocepacia, in preclinical models of CF.